People with disabilities face a higher risk of bullying, abuse, and violence than their peers, and the generous support of the Lowell Berry Foundation has supported, for over a decade, Kidpower safety workshops empowering those with disabilities as well as their family members, mentors, and allies. We are particularly grateful that the foundation recognizes not just the importance of safety for children but also of safety for teens and adults with disabilities. Adults with disabilities face personal safety on an everyday basis yet may also lack resources to plan and pay for services. Support from the Lowell Berry Foundation makes it possible for us to provide valuable, potential life-saving training through partnerships with the nonprofit agencies serving them in other ways. Thanks to the Lowell Berry Foundation, more Contra Costa and Alameda County residents with disabilities are equipped with skills to take charge of their safety – and to share those skills with their own families and friends, extending the impact far and wide. Cisco seeks to invest in programs that promote wellness and positive health habits with a special emphasis on violence prevention, with a recognition that violence has a significant impact on children. Cisco’s support for Kidpower over the years has brought Kidpower programs and resources to schools and communities, impacting countless children and families. In 2018 alone, more than 250 youth, 75 parents, and 25 educators will benefit from direct Kidpower services made possible thanks to Cisco’s support. As those who benefit directly use and share their skills with friends, family, students, and others in their lives, the knowledge and skills will continue to ripple out into our neighborhoods and schools. We are grateful for Cisco and their investment in the prevention of violence and the protection of children! Thanks to the generous support of Sereno Palo Alto, young people in the Ravenswood City School District are learning skills they can use right away to be safe from bullying, abuse, and other violence, now and for years to come! Sereno Palo Alto’s contribution in support of Kidpower’s service in the Ravenswood City School District has provided workshops for sixth grade students with their parents and caregivers during this academic year and will be supporting professional development training and classroom workshops to start the 2018-19 school year off with skills to support cultures of safety and respect in classrooms and on playgrounds throughout the region. We are grateful for the support of Sereno Palo Alto – and for the opportunities their contribution has created for Kidpower to bring powerful safety skills to vulnerable young people in our community! The Santa Cruz Rotary Club has demonstrated a deep and lasting commitment to supporting worthwhile charitable causes serving the Santa Cruz community. We are grateful for the Club’s support of Kidpower services to help keep kids safe from bullying, violence and abuse! Thanks to their recent donation, Santa Cruz children together with their educators, youth services providers, parents, and other caregivers will learn age-appropriate social safety skills they can use right away – and for the rest of their lives! – to have safer, more positive experiences with people everywhere they go. The People with Disabilities Foundation (PWDF) is dedicated to providing education and advocacy for people with psychiatric and/or developmental disabilities so that they can achieve equal opportunities in all aspects of life. Kidpower California is honored to be a recipient of grant funding from PWDF in support of our social safety workshops providing children, teens, and adults with developmental disabilities with opportunities to practice skills for being safe with people out in the world, on campus, on the job, online – everywhere! In just the last 2 months, 104 people with disabilities have participated in Kidpower workshops made possible by PWDF – as well as 46 professionals and 16 adult family members enthusiastically joining in so they can continue practicing together! The mission of the Dean and Margaret Lesher Foundation is to enhance the quality of life for residents of Contra Costa County, California. The Foundation’s generous support of Kidpower underscores their recognition that the skills we teach make a positive difference in the quality of life of children and families. In 2017 alone, more than 500 children, parents, and teachers have benefited from direct Kidpower services made possible thanks to the support of the Dean and Margaret Lesher Foundation. As the impact of their generosity ripples forward and touches more people, we will remain deeply grateful for the support of the Dean and Margaret Lesher Foundation! Driscoll’s Charitable Fund is dedicated to supporting services that meet the education and health needs of agricultural workers and their families. Thanks to the generosity of the Driscoll’s Charitable Fund – which first awarded a grant to Kidpower in 2004 – hundreds of children of agricultural workers in Monterey County have benefited from the opportunity to learn Kidpower skills to set boundaries, project awareness and confidence, protect themselves from hurtful words, and persist to get help from busy adults when they have a safety problem. Driscoll’s support has also helped to provide Kidpower services for migrant farm working parents through the Monterey County Office of Education’s Migrant Education Family Literacy program. This collaboration has empowered more than 100 parents with skills as well as with written materials they can use with their very young children to support the development of literacy skills and safety skills in the crucial early years! Since 2012, almost 200 vulnerable youth in the Silicon Valley have learned Kidpower social safety skills to be safe from bullying, violence, and abuse thanks to the generous support of the Mission City Community Fund! Those served include state preschool students, teens with developmental disabilities, pregnant and parenting teens, and families coping with poverty. In addition, the Fund’s support has provided Kidpower services for over 100 of their educators, parents, and caregivers, empowering them with skills to protect and empower these vulnerable children as they grow. Countless others are benefiting as all those who have learned powerful skills to support safety through these workshops use, share, and teach these skills with and around their friends, their families, and those they serve. Dedicated to enriching the quality of life in Santa Clara and the Silicon Valley, the Mission City Community Fund’s support of Kidpower reflects their deep commitment to education and social services. We are grateful for their support! The Western Digital Foundation is committed to supporting education, basic needs, and civic and community well-being in areas where their employees live. Since 2008, more than 1,650 people in Santa Clara County and southern Alameda County – primarily children, people with disabilities, and the educators and human services professionals who serve them – have learned Kidpower skills as a direct result of support from the Western Digital Foundation. As a result, some of the most vulnerable members of our communities now have stronger skills to be safe from bullying, abuse, and other violence. In addition, those providing them with care, education, and mentorship are equipped with more skills to protect them from harm. As the positive impact of the Western Digital Foundation’s investment in community safety and well-being through their contributions to Kidpower will continue to ripple through our families, classrooms, schools, and neighborhoods for years to come, we extend our deep thanks for their generous support! The Albertsons Companies Foundation has generously supported our Fullpower Workplace Safety Program serving adults with developmental disabilities for years, and we are grateful! People with cognitive disabilities have much to offer as employees and as community volunteers, but sadly, concerns about their own personal safety can create barriers to their participation and success. Thanks to The Albertsons Companies Foundation, more than 300 older teens and adults with developmental disabilities, together with more than 70 professionals who offer them mentorship and guidance, now have stronger skills for setting boundaries, projecting awareness, speaking up effectively about possible problems, and protecting themselves from hurtful words while also being able to take in constructive feedback that will improve their effectiveness. The skills they learned with Kidpower will help them be safe and thrive now and for years to come. Thank you Albertsons Companies Foundation! Through their 1% for Good Program, each Sereno Group office gives back to the communities they serve. We’re pleased that the Sereno Group Willow Glen office in San Jose, California chose to honor the good work that Kidpower is doing helping kids be safe! They selected Kidpower’s South Bay office as a 1% for Good beneficiary, and thanks to their support, hundreds of children, parents, and teachers in Sereno Willow Glen’s San Jose community are getting access to Kidpower skills training this academic year. The Pacific Life Foundation is dedicated to supporting organizations addressing a broad spectrum of social issues in the communities where their employees live and work. Their generous contribution to Kidpower has, in this year alone, given the gift of safety to hundreds of children, parents, teachers, and social workers in the Los Angeles area. As Kidpower works to expand our services in Southern California, we are deeply grateful for the opportunities created by the Pacific Life Foundation, as their funding has made it possible for us to reach out to groups serving vulnerable populations who had no past experience with Kidpower. As a result, more people have access to knowledge, resources, and information they can use to help their schools, families, and communities be safer. Thank you, Pacific Life Foundation! Hitachi High Technologies in Pleasanton, California is committed to giving back to the surrounding community in ways that make a lasting and meaningful difference. In the decade since their Community Action Committee first awarded a grant to Kidpower, Hitachi High Technologies America has helped hundreds of vulnerable children and teens in the East San Francisco Bay Area — particularly East Bay kids with disabilities — get access to Kidpower safety skills services tailored to their ages and life situations. In addition, Hitachi High Technologies has recognized the value of empowering parents and teachers with skills and knowledge they can use to help the young people in their care learn skills to be safe with people at school, online, and out in the world. The In-N-Out Burger Child Abuse Foundation’s purpose is to assist children who have been victims of child abuse and to prevent others from experiencing child abuse. Given the foundation’s focus not just on helping but also on instilling hope for children, Kidpower’s positive, joyful workshops focusing on safety, empowerment, and confidence have proven to be an excellent tool for instilling hope in children facing difficult life situations. More than 1,500 children in the Greater San Francisco Bay Area have benefited directly from Kidpower’s experiential safety skills workshops provided with support from the In-N-Out Burger Foundation since they extended their first award to Kidpower in 2005. More than 200 social service and education professionals working directly with these children have also received training side by side with them. As a result, hundreds caring adults working closely with victims of abuse have acquired skills to help kids be safe, skills they have the opportunity to use throughout their careers working with at-risk children. Through their work, the support of the In-N-Out Burger Child Abuse Foundation continues to touch children and give them skills for safety, confidence, and hope. The Palo Alto Medical Foundation is dedicated to enhancing the well-being of people in the communities it serves, especially vulnerable populations. Through their generous support of Kidpower, the Palo Alto Medical Foundation has given children access to Kidpower services together with their parents and caregivers. As a result, hundreds more children have skills to have safer, more positive experiences with people, and hundreds of parents and caregivers have more skills to protect children’s emotional and physical health and well-being as they grow. The San Jose Sharks Foundation is dedicated to enhancing the lives of youth and families in the Silicon Valley communities surrounding their Santa Clara County facility. They recognize that bullying, abuse, and other violence can prevent young people from thriving and that Kidpower is tackling these concerns proactively and effectively through collaborative work in schools and social service agencies throughout the region. Thanks to the San Jose Sharks Foundation, hundreds of young people — as well as their parents and teachers — have experienced Kidpower services firsthand, building skills that can help them prevent, avoid, and de-escalate safety problems now and for years to come. The Palo Alto Community Fund is dedicated to improving the quality of life in the Palo Alto area, and their generous support of Kidpower has helped hundreds of young people particularly vulnerable to violence learn skills to be safer at school and in their communities. Street violence, gang violence, and poverty touch far too many many children and families in the East Palo Alto area. The dedicated educators in East Palo Alto’s Ravenswood City School District work tirelessly within this context to provide safe, positive learning environments that empower children to thrive and to pursue excellence, and they have partnered with Kidpower to support these efforts. Grant funding awarded to Kidpower by the Palo Alto Community Fund has enabled us to provide Kidpower Classroom Workshops for children with their teachers at all six elementary schools in the district as well as for preschoolers with their teachers at the Ravenswood Child Development Center. In addition, the Palo Alto Community Fund’s contribution has helped provide Kidpower Parent Workshops in English and in Spanish at all seven sites so that parents have additional tools and skills for protecting their children from violence and abuse while also leading their children’s safety skill development. On behalf of all the children, parents, and educators who have learned new skills as a result of their support, we extend our deepest thanks to the Palo Alto Community Fund! In 1989, the 6.9 Loma Prieta earthquake disrupted the first public Kidpower workshop in Watsonville. The building we had been teaching in collapsed – and the energy and resources of our community went to earthquake relief for many years – making this a challenging time to start a nonprofit! In addition to providing many contributions to help communities rebuild, the Wells Fargo Foundation gave $5,000 grants to help nonprofits that had been harmed by the earthquake. This support was essential in Kidpower’s first year, making it possible for our new nonprofit to keep going despite the huge setbacks resulting from this disaster. Many times over the 25 years since then, Wells Fargo has generously funded important projects to support Kidpower’s work in schools, helping keep preschool and elementary school children safe from bullying, violence, and abuse through empowering teachers, parents, and children with awareness, knowledge, and skills. This fall, Kidpower was also honored to receive a surprise additional $1,000 donation for general support at a breakfast honoring Santa Cruz nonprofits. 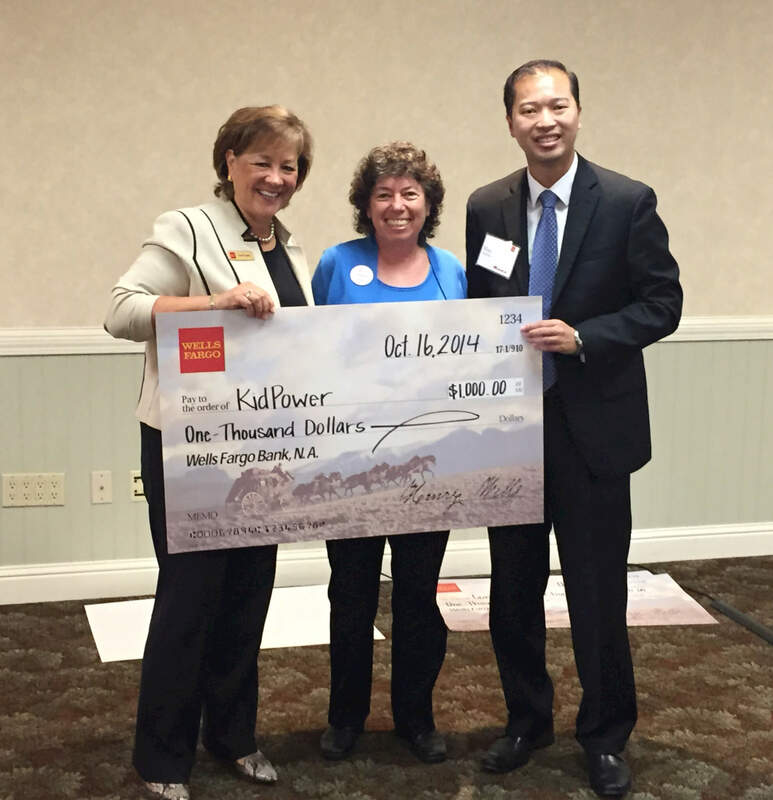 We deeply appreciate Wells Fargo Foundation’s commitment to healthy, caring, safe communities! 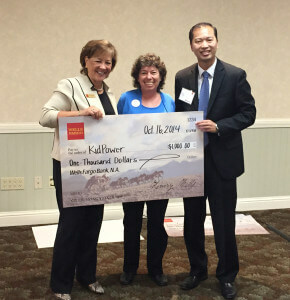 Kidpower was honored along with other Santa Cruz nonprofits at a very special Wells Fargo Foundation breakfast. The Kaiser Permanente Community Benefit Program in San Francisco has increased the safety of youth in San Francisco through its generous support of Kidpower. Thanks to the Kaiser Community Benefit Program of San Francisco, Kidpower has been able to provide training in skills to prevent bullying, cyber-bullying, abuse, and other community violence for high-risk children and teens — together with their parents, teachers, and youth group leaders — at public schools, Boys and Girls Clubs, and other nonprofit agencies throughout the City. Their generous support makes it possible for Kidpower to provide direct services for schools and agencies committed to bringing Kidpower skills to their youth but lacking resources to address the costs. Thanks to the Kaiser Community Benefit Program of San Francisco, many more San Francisco children and teens have skills to be safe and thrive at school, online, in the community, and everywhere they go. 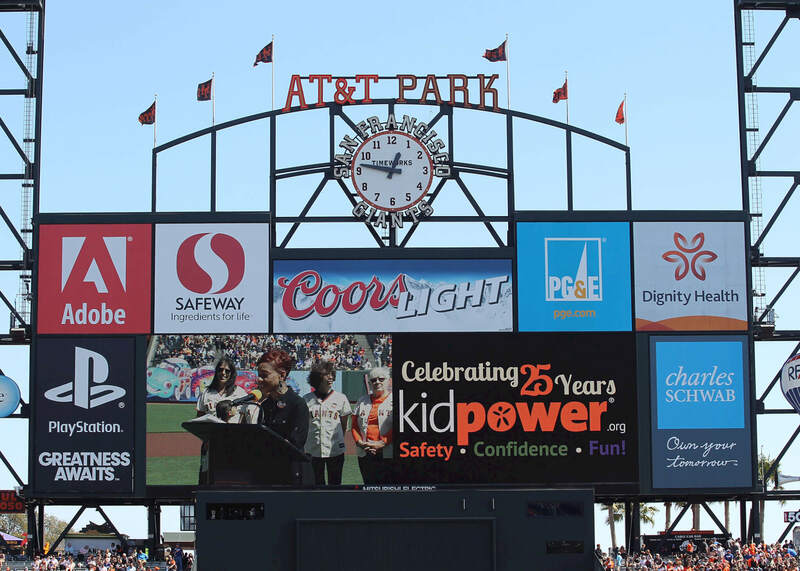 Thank you, San Francisco Giants Community Fund for honoring Kidpower as a grant recipient during “Strike Out Violence Day” at AT&T Park Sunday, September 14! 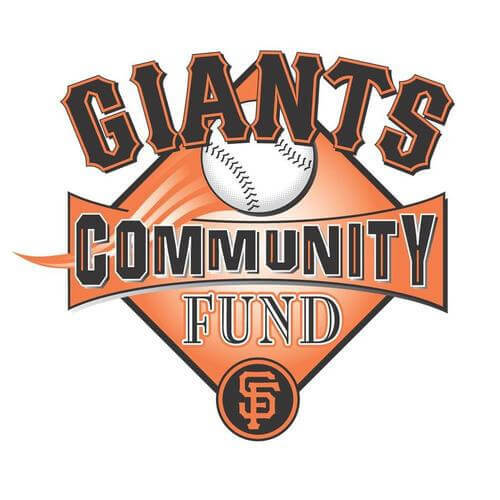 The Giants Community Fund has awarded grant funding to enable Kidpower to provide bullying prevention skills workshops for children and youth throughout the San Francisco and Monterey Bay regions. Thanks to their support, young people will learn skills they can use to avoid, prevent, or face bullying with skills and confidence! 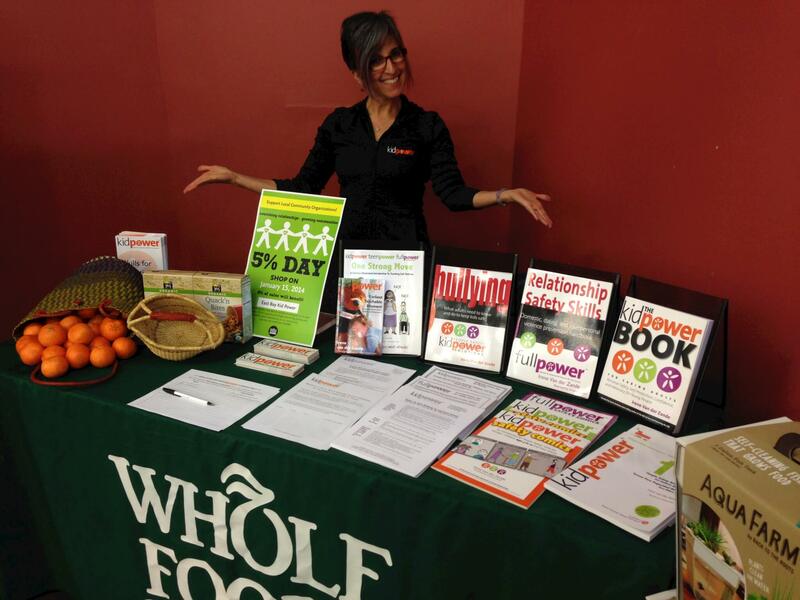 Whole Foods in Mill Valley, California, Fresno, California, and Cupertino, California have supported Kidpower with their Dimes for Donations Program, Nickels for Nonprofts Program, and their 5% Day during the months of June through August 2014! Whole Foods has supported Kidpower in many communities through its generous local giving programs, raising funds to support Kidpower workshops in their own communities. Hundreds of children and other vulnerable people have learned Kidpower skills to be safe thanks to the generosity of Whole Foods. Since 2009, OCB has arranged Fullpower Full Force workshops every year or so for the adults who live at the residential facility for 6-9 months as they build skills for maximizing independence without vision. Some have lost vision, or are losing vision, gradually; for others, illness or injury has affected vision abruptly. For so many of us, vision plays a role we might take for granted in taking charge of our personal safety. When vision is lost or affected, adults who had previously felt confident moving through the world as sighted people can feel a greater sense of concern, not only because of the change in their own abilities but also because of how others might perceive them. For many years, advisor Victor Cheng, who is the author of The Recession-Proof Business and Extreme Revenue Growth, has donated priceless business consultation to Kidpower through his company www.victorcheng.com. Thanks to his expertise, we are doing a far more effective job of telling our story and of marketing our organization, resulting in increased safety and confidence for hundreds of thousands of young people. Through Victor’s guidance, we have initiated projects that have greatly increased our reach, such as our One Million Safer Kids campaign. Victor is also a strong Kidpower supporter, who has created a unique way of bringing new resources for our organization. Hundreds of MBAs have found excellent career opportunities thanks to help from Victor’s free six-hour case interview workshop on his website. In the introduction, Victor provides a compelling testimonial about Kidpower and asks that people who have found the free case interview workshop to be of benefit make a donation to Kidpower of $47 or more. As a result, Kidpower has received donations of $47, $50, $100, $250, and $500 from successful job hunters from all over the world. Their gifts have added up to many thousands of dollars towards bringing Kidpower skills to everyone, everywhere. Verizon is committed to forging partnerships and focusing on social issues that impact their customers, communities, and employees in the areas of education, literacy, safety, and health. For years, Verizon been improving lives by supporting efforts to prevent domestic violence. Verizon’s grants help women and children who have experienced domestic violence build lives where they can feel safe and strong. Kidpower is honored to have received a grant of $90,000 from Verizon to bring Kidpower training to women and children as well as to domestic violence professionals and law enforcement officers. Verizon recognizes that Kidpower makes a real difference for women and children coping with domestic violence. It also recognizes Kidpower’s unique capacity to offer skills and resources that police and other professionals can use right away to help families dealing with domestic violence. Thank you, Verizon!